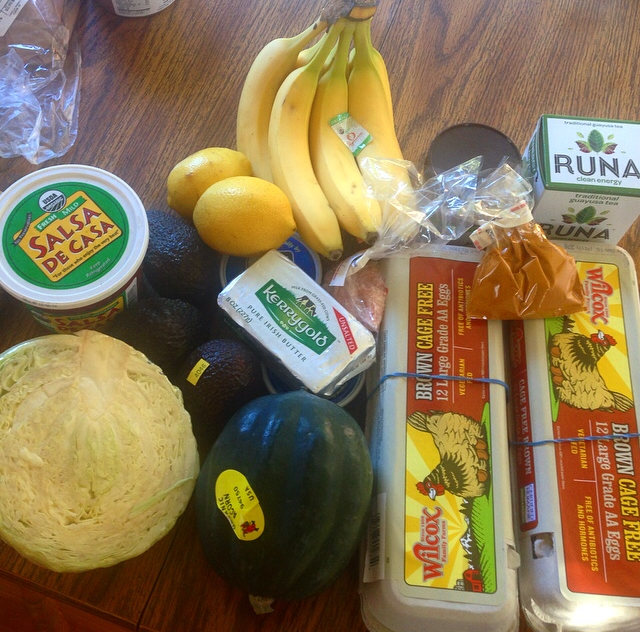 Weekly Food Haul (and the importance of the FCQ)! Hello party people! I have recently received quite a few “what do you actually eat?” questions from clients and fans on my facebook fan page and I thought it was a fitting time to show you exactly how I do my food shopping and what I (generally) recommend to others when they ask me how to shop for food. To give you a little bit of context as to how I work with my clients, whenever I work with a personal training client or health coaching client, I never tell them exactly what to eat, but I do normally start them out with a list (this is just one of the lists that I use) of nutritious foods to include in their daily menus. I find that encouraging clients to add in healthy, unprocessed, fresh foods (also called “crowding out”) vs. simply eliminating “bad foods” (sugar, candy, processed foods) is a good way to help facilitate a transformation into healthier eating habits. You eat more good foods, you feel better, you crave less processed foods because you’re getting the nutrients that you need, and before you know it, you’re getting healthier without putting yourself into a state of deprivation. Boom! I am also a true believer in the principal of Bio-Individuality. The premise of Bio-Individuality is that no single way of eating works for everyone, hence I get to know my clients before recommending specific foods to them. I wouldn’t necessarily recommend my personal diet to everyone, but I do make informed food choices that consist mainly of unprocessed, whole, organic foods and I encourage my clients to make similar informed food choices, whether they eat a vegan, vegetarian, or paleo diet. I could go on for days about ways to make better food choices, and I could go into pages of detail about different dietary theories, hence those subjects will be addressed in future blog posts:) For now, let’s keep it simple. One question that I ask myself when making food choices is: “does eating this align with my goals of having clear skin, optimal health, tons of sustainable energy, healthy joints, and faster running performances this year?” I call this my Food Choice Question or my FCQ. Cheese, for example, always makes me break out, so I will never buy cheese because when I ask myself this question, I realize that it is not in alignment with my goal of having clear skin. Coffee, while high in antioxidants, also does not make the cut, because I have determined for myself that I want “tons of SUSTAINABLE energy” and given that I crash 3 hours after drinking coffee, I opt for Runa Tea instead-great energy, high in antioxidants, and no crash. I highly encourage YOU to come up with a similar question for yourself, as a way to make a habit of aligning your food choices with your life and health goals. It really works, I promise! 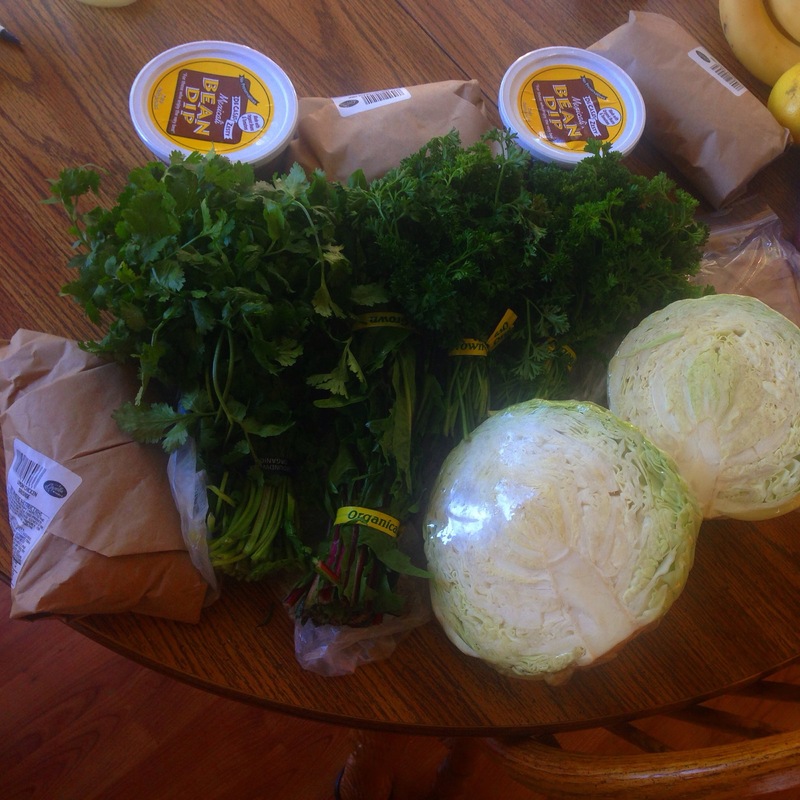 So, without further adieu, here is my weekly food haul: my choices are all guided by my FCQ. We mainly shop at a local market called Capella and all of our meats are grass fed, our eggs are pasture raised, and our vegetables are organic (though we follow the “clean 15” and “dirty dozen”) rules when it comes to buying produce. Since I couldn’t fit all of my groceries in one photo, below is the second half of my weekly grocery haul! I spend about 2 hours on Sunday evening doing some “batch cooking” for the week, making paleo egg muffins, salad dressing, chopping veggies, etc. I will easily eat all of these veggies this week, plus the 3 lbs of celery that I already have in the fridge! So there you have it! Hope you enjoyed a peek into my weekly food shopping protocol. How many times a week do you shop for groceries? Do you have a FCQ that you want to share below? If so, please share in the comments!!! Hope everyone has a fantastic week! 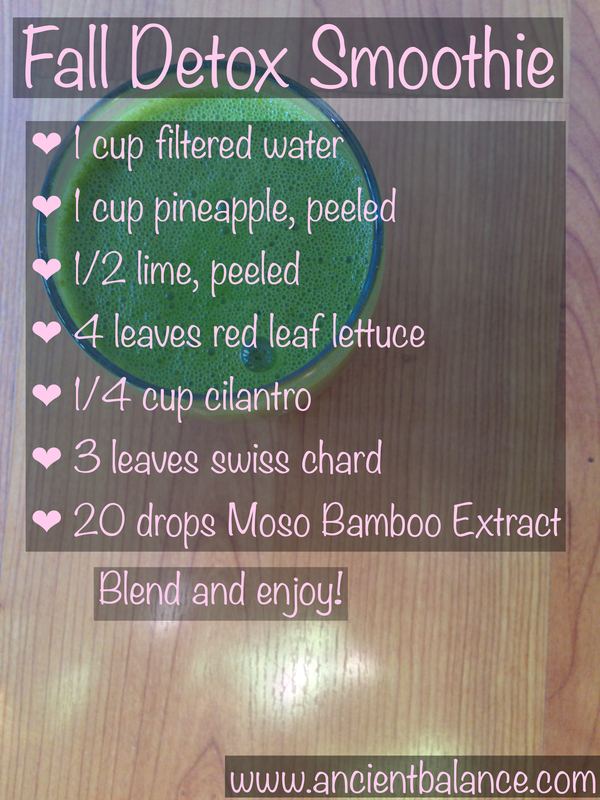 I hope you enjoy this smoothie as much as I do! I’m always on the hunt for new, great smoothie recipes so if you have a good one, or a link to one, feel free to post it in the comments below! Happy Hump Day and have a fabulous rest of your week! Hello! I haven’t written on here for a while because I have been away on an epic vacation in France! If you would like to hear a little bit about my trip, keep reading! I went to France first and foremost to visit my best friend, the owner of The Hakuna Matata House , a charity organization that I hold near and dear to my heart. 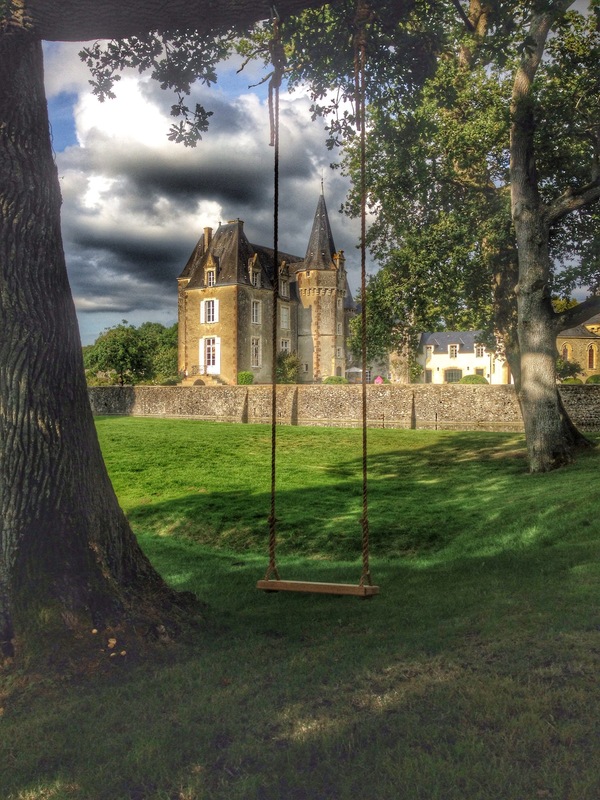 My friend’s family owns a beautiful chateau in the Northwest region of France, which is about a 3 hour drive away from Paris. 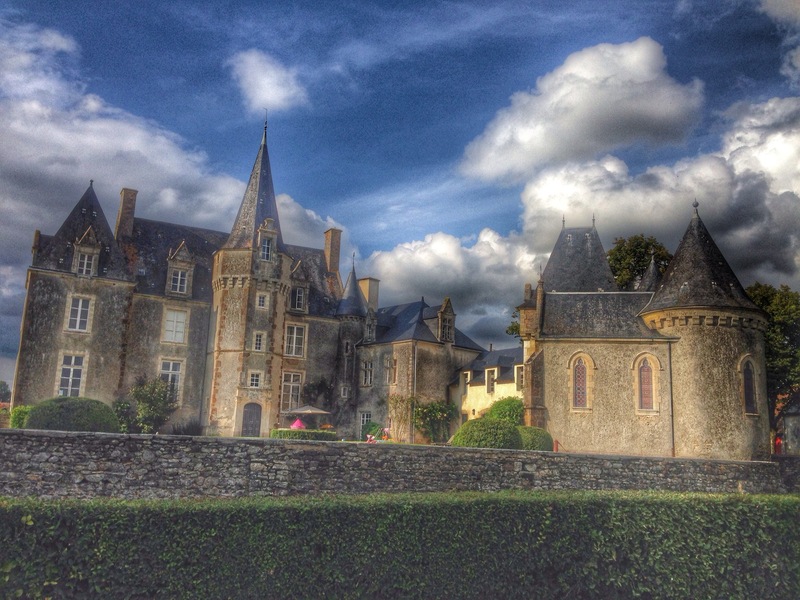 This is my second time visiting my friend at her family’s chateau and I openly refer to it as “my favorite place on earth” because it really is the most heavenly, beautiful, peaceful place I have ever visited. To give you a little bit of info about the chateau, I share with you a summary of it’s history, written by my friend’s family. They are the most amazing hosts and I am forever grateful to them for allowing me, my mom, and my boyfriend Jay to stay with them at their beautiful chateau. defended the entrance by the drawbridge. A well was located in the interior courtyard. coat of arms of DuMesnil. I took hundreds of photos with my trusty iphone while I was in France, but today I share with you my absolute favorites. This is a photo of Chateau Cerisay that I took from across the moat. Doesn’t it look like something out of a dream? 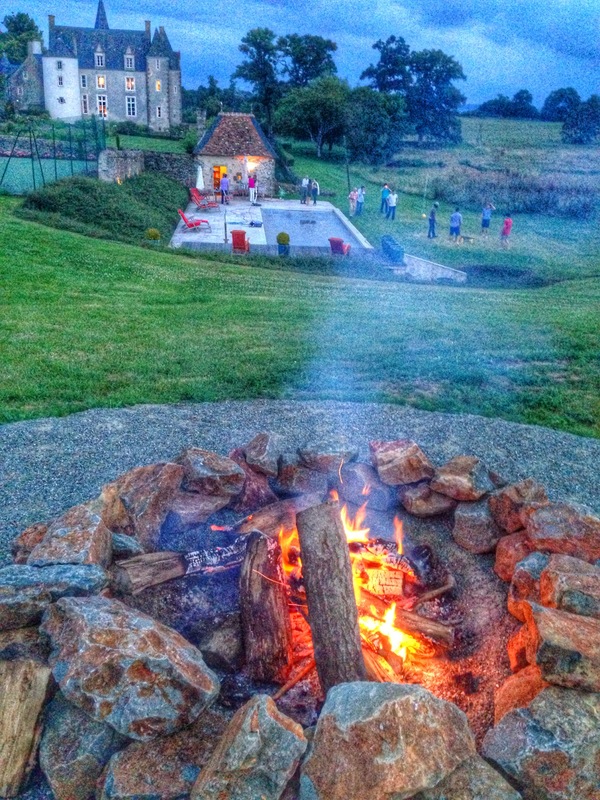 This is the bonfire overlooking Chateau Cerisay. We would walk up here after dinner and stay until after dark, listening to music, enjoying great conversation, roasting marshmallows and chocolate (I ate the chocolate, but passed on the marshmallows) and watching the other guests play tether ball and “spike ball” down by the pool. It felt like an amazing adult summer camp, at a castle! 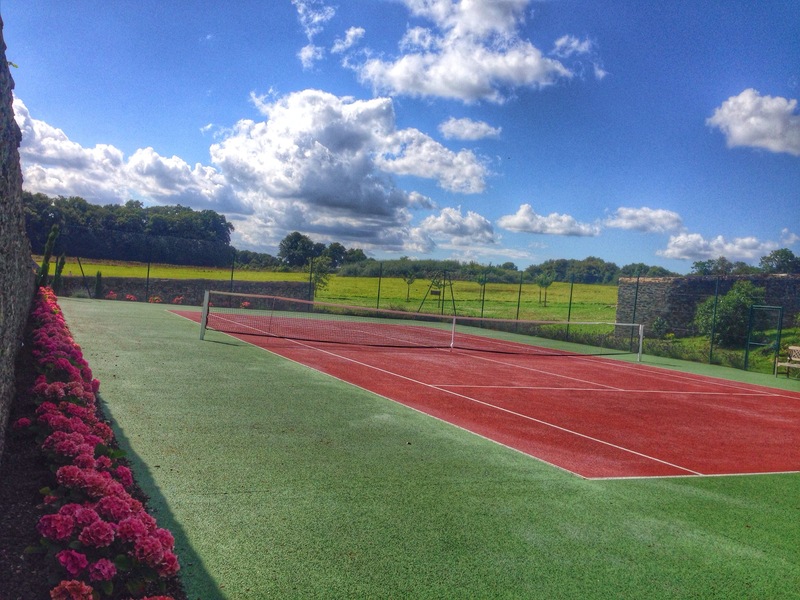 These are the beautiful tennis courts on the property, a short walk from the castle. I can’t imagine a prettier place to play tennis! (p.s. I’m not very good at tennis, but luckily my boyfriend Jay isn’t either, so our lack of skills made us perfect tennis partners). 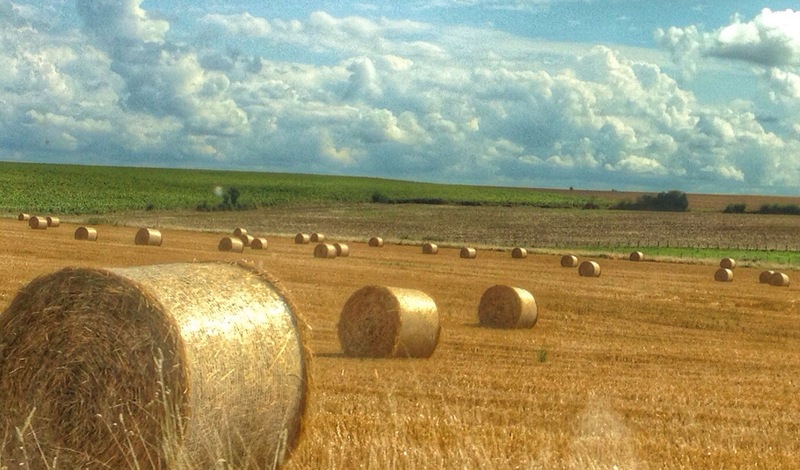 Isn’t the french countryside picturesque? Every time I looked out the window, the scenery reminded me of a gorgeous painting. Hope you enjoyed a glimpse into my travels and I apologize that this took so long to post. I will share more photos in the following post!